There are two different paths you can go when choosing an awards show host. You can pick a safe, overly professional veteran or you can go with a wild card. 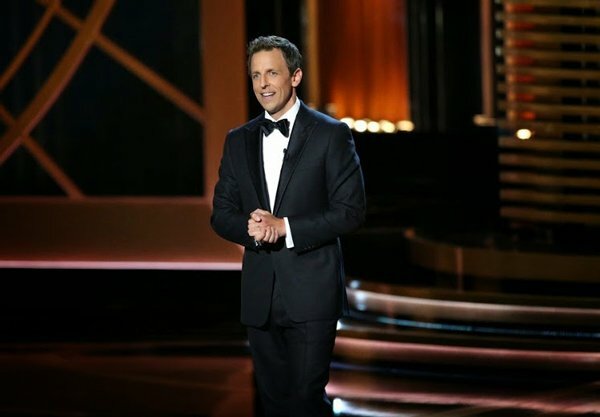 This year, the Emmy Awards decided to go with the clean and comfortable professional in the form of Seth Meyers. Not surprisingly, he gave everyone exactly what they were expecting: a funny, quick-witted monologue with good momentum. Touching on topics such as HBO’s less than stellar past (repeated airings of Poltergeist), how many TV shows are about to be cancelled (almost all of the new ones) and Netflix doing to cable what cable once did to network TV, the monologue was both topical and irreverent, featuring way more jokes than hit than missed and a good balance of targets. Seth Meyers was his topical confident self throughout, and the audience seemed to be eating it up. Of course, there’s a downside to going safe, and it’s this. While people still have a very vivid memory of Ricky Gervais’ haymakers at the Golden Globes a few years ago or at Tina Fey and Amy Poehler’s dominance, it’s highly unlikely anyone will remember any of these jokes a month from now, let along multiple years from now. Think of it like a party. Seth Meyers is never going to throw the insane rager where people get naked and go to Waffle House at 6 AM. He’s going to show the familiar gettogether with some light wine. That being said, no one threw up in the pool. So, that has to be considered a win. There’s no word yet on whether or not Seth Meyers will be invited back to host, but it’s a pretty safe bet that he won’t be taken off the list. He’ll be the safe, reliable back-up for the next half decade.